Since 2001 requirements on human factors procedures and competences have been introduced in the European aviation regulations related to maintenance. All staff directly or indirectly involved in maintenance of aircraft or components in EASA Part-145 organisations must receive initial and continuation training on human factors. Similar requirements are being developed for other elements of the airworthiness chain: design, production and continuing airworthiness management. Jargon started delivering trainings on human factors in maintenance in 2001. Roger van der Velden was trained and certified as the first independent STAMINA human factors trainer by Trinity College in Dublin. Since then, numerous persons have been trained in all levels of organisations and authorities. This includes both initial training and continuation training. Roger van der Velden is an EAAP certified Human Factors Specialist. Jargon's human factors trainings are very interactive in nature and go beyond imparting knowledge. They include the use of group discussions, video materials, case studies, role play etcetera. Competences are trained, awareness is created and impulses are given for changes in attitude and improvements of the organisation. The training materials have been and continue to be updated and amended, based on results of recent research and on experiences from delivered trainings. For in-house trainings and continuation trainings the content of the training is adapted to the particular organisation. This allows to include specific subjects or content based on recent occurrences or incidents. The STAMINA training is was originally developed by a consortium led by Trinity College of Dublin and later amended and updated by Kratis Training & Consulting and Jargon Aviation Consultancy. The STAMINA core course covers and exceeds the requirements of Part-66 Module 9 and the Part-145 Guidance Material. The training starts with an introduction in which a production game is played. 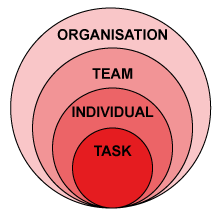 The core of STAMINA training consists of four modules, covering the task, the individual, the team and the organisation respectively. A fifth module representing the operational environment was added later. A film developed especially for STAMINA is used to show a simulated aircraft maintenance organisation at work. Scenes from this film, experiences from the production game and personal experiences of the participants are used during the training as examples and starting points for discussion. More information on the STAMINA human factors training can be downloaded here.